As has been the case since its very beginning in 1985, the nonprofit Farm Aid organization’s annual schedule is built around a star-studded fundraising concert held in a different city every year. For its 30th anniversary this year, Farm Aid came to our hometown of Chicago, and if you were just out for fun, it would have been hard to top the show at the FirstMerit Bank Pavilion on Northerly Island, just off the city’s museum campus. 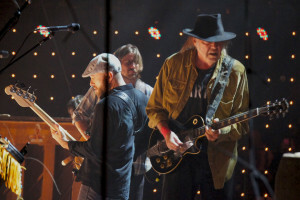 Neil Young performing at the Farm Aid 30 concert in Chicago Sept. 19. 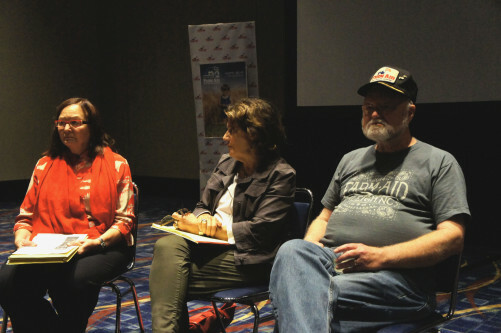 Friends of FamilyFarmed participated in the Film2FarmAid Festival at the McCormick Place convention center, including documentarian Jeff Spitz of Food Patriots and Mark Wilhelms, producer of A Chicago Ranch. But to mark its milestone year, Farm Aid also presented a range of discussions and events that provided deep perspective on the farm crisis of the 1980s — which gravely threatened the lives and livelihoods of tens of thousands of family farmers and spurred the organization’s creation — and how family farmers still face challenges that keep Farm Aid’s grant and disaster assistance programs, farmer hotline and Farmer Resource Network busy not just for an annual concert, but all year round. Anyone who had the opportunity to attend these events received a rich and often moving education in why the nation needs to rally around family farmers to keep them on the land and enable them to succeed and thrive. Carolyn Mugar — Farm Aid’s executive director since shortly after the first concert in 1985 — introduces the first panel at Farm Aid 30: Strength From Our Root in Chicago on Sept. 17. Jim Hightower, the farmer advocate who served as Texas agriculture secretary from 1983 to 1991, sits behind Mugar. 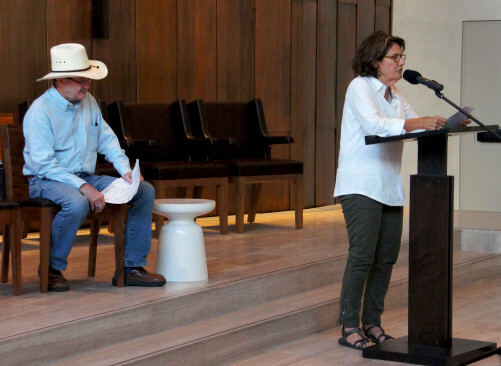 These history lessons were powerfully imparted during a two-day program, held Sept. 17-18 at the Fourth Presbyterian Church in downtown Chicago, titled Farm Aid 30: Strength from Our Roots. The first day, which was programmed for public participation, featured activists and farmer advocates who were active at the time Farm Aid came into being. Several described how family farmers faced severe pressures beginning in the 1970s from the philosophy of “get big or get out” that was most closely identified with Earl Butz, a secretary of Agriculture in the administration of President Richard M. Nixon. This prompted farmers to stage “tractorcades” in Washington, D.C. and spurred the rise of organizations such as the American Agriculture Movement (AAM). But this threatening trend became a full-blown crisis in the early 1980s as farmers became caught in the crosswinds between a collapse in grain prices (caused in part by a grain embargo invoked against the Soviet Union by President Jimmy Carter in response to that nation’s invasion of Afghanistan) and new, fiscally oriented policies under President Ronald Reagan, Carter’s successor, that prompted a wave of farm foreclosures to get delinquent loans off the government’s books. The first panel at the Farm Aid 30: Strength from Our Roots event included (left to right) Ralph Paige of the Federation of Southern Cooperatives; Paul Sobocinski of the Land Stewardship Project; Roger Allison of the Missouri Rural Crisis Center; Helen Waller of the National Save the Family Farm Coalition; David Senter of the American Agriculture Movement; Mark Ritchie, former Minnesota secretary of state; Carolyn Mugar, executive director of Farm Aid; and Jim Hightower, former Texas agriculture secretary. The evening brought a presentation of the 1984 theatrical film Country, starring Jessica Lange and Sam Shepard, which brought the farm foreclosure crisis home to the general public. The showing was followed by a panel discussion that included Carolyn Mugar, Farm Aid’s executive director since just after that first concert 30 years ago; Senter; and Sarah Vogel, who in 1984 won the landmark federal court case that placed a permanent injunction on further federal foreclosures, a victory that is estimated to have enabled upwards of 80,000 farmers to keep their land. A screening of the 1984 movie Country was followed by a panel discussion featuring (left to right) Sarah Vogel, the lead lawyer in the case that resulted in an injunction that blocked federal farm foreclosures; Farm Aid Executive Director Carolyn Mugar; and David Senter of the American Agriculture Movement. 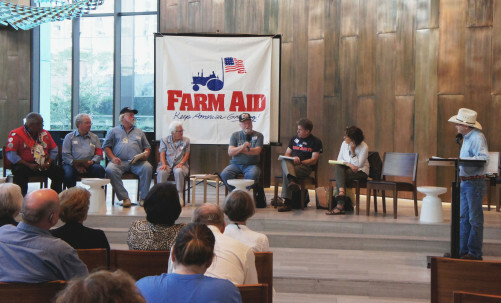 As a personal aside, in my past long career as a political journalist in Washington, D.C., I referred frequently to “the farm crisis of the 1980s.” But I did not fully realize the depths of despair to which many farmers were driven during that era until I heard the first-person accounts delivered at Farm Aid 30. Mona Lee Brock was an Oklahoma farm woman who was moved to co-found the National Farm Crisis Center and its telephone hotline after learning about a financially desperate rancher who committed suicide after calling his daughter and instructing her to come out and pick up his body. 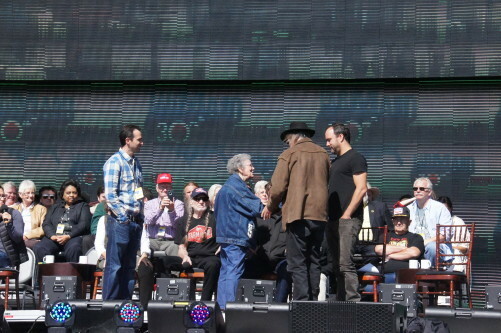 Neil Young (brown jacket) and Dave Matthews (black shirt) greet Mona Lee Brock of Oklahoma, whose life-saving efforts with the suicide prevention crisis hotline she started during the farm economic crisis of the 1980s were highlighted during the Farm Aid events in Chicago. The farm crisis prompted the establishment of the Farm Aid organization in 1985. “You never know until you pick up that telephone what will come in,” Brock added. 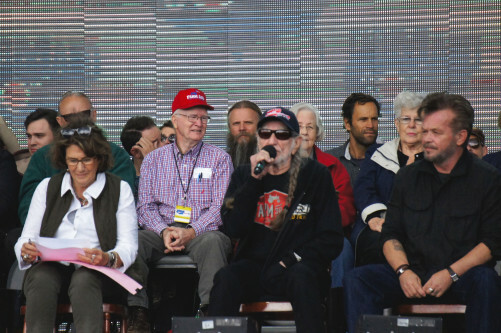 The news conference also included statements, some of them strongly political, from the rock stars who make up the Farm Aid board. Dave Matthews struck a similar tone while noting the changes in public attitudes that have been instilled by the Good Food movement. “We have a growing awareness, a more public awareness in a way, about where our food comes from and how our food is produced. Maybe more of us know now than we did 20 years ago, there are more restaurants that have local food and pride themselves in doing that,” Matthews said. This entry was posted in Family Farms, Farm Aid, Farm Aid concert, Farm businesses, Food documentaries, Food education, Good Food Festivals, Good Food movement, Good Food Photos, Small Farmers, Sustainable food systems and tagged American Agriculture Movement, Carolyn Mugar, Country film, Dave Matthews, David Senter, Farm Aid, Farm Aid 30 Chicago, Federation of Southern Cooperatives, Imagine Dragons, Jack Johnson singer, John Mellencamp, Kacey Musgraves, Mavis Staples, Mona Lee Brock, National Farm Crisis Center, Neil Young, Ralph Paige, Sarah Vogel, The Monsanto Years, Willie Nelson. Bookmark the permalink.